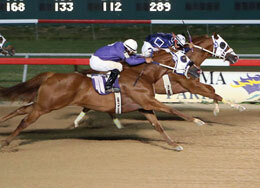 Bubba Carver (inside) holds off One Eyed Eagle to win the Ben E. Keith Stakes at Retama Park Saturday. SELMA, LA�JUNE 22, 2013�Douglas O. Traylor's 3-year-old gelding Bubba Carver made his 2013 racing debut Saturday night in a nose victory over One Eyed Eagle in the $15,000 Ben E. Keith Stakes at Retama Park. Under jockey Francisco Calderon Bubba Carver got the first call and held off a late charge to the winner's purse of $8,250. He completed the 330 yard course in :16.981 seconds a 97 speed index. Judd Kearl conditions the Bob and Jerry Gaston Texas bred WAVE CARVER gelding out of the Fredricksburg mare Rustys Lil Lady. It was the fourth win in nine starts for Bubba Carver and pushed his career total to $44,205. His dam is also the dam of 2012 Texas Classic Futurity(G1) winner Valiant Lil Lady ($491,519). Making her second start this year, One Eyed Eagle pressed the leader under jockey Santos Carrizales. Bobby Martinez trains the filly for Tommy Hays and Charles Forbes, Jr. The two-time futurity finalist bred by Hays and Vessels Stallion Farm, LLC has earned $44,366. Allen Jacoby and Jesse Yoakum's Grizzly Water finished a length back to pickup the show check worth $1,500. Also trained by Yoakum, the gelding from the Leaving came into the race off a ninth place effort in the Adequan Sam Houston Derby on May 18. Jerry Yoakum was aboard. James E. Helzer is the breeder. Completing the field were Sting Bikini, Tres Alley Cat, Leading Version, Jabulani, Runaway Bye Rr, Down For A Fortune and Cruisin Finish.